We felt privileged today to meet Nicola, Sarah and six-month old Zack at the Manchester Cancer Research Centre to accept an amazing cheque donation from their recent fundraising festival. Dr Gray Kueberuwa, our funded researcher, was also kind enough to give Nicola and Sarah a tour of the laboratory. He told them a bit more about our current immunotherapy research project, looking at more effective ways to treat children with brain tumours. The family and friends of five-year-old, Joshua McCormack, held a fundraising festival in May to remember Joshua and mark what would have been his seventh birthday. Named, JoshFest, the event was held in Joshua’s home town of Whitworth, near Rochdale, and was a complete sell out with hundreds of supporters enjoying the festivities, including live music, raffles, cake stalls and a quiz. 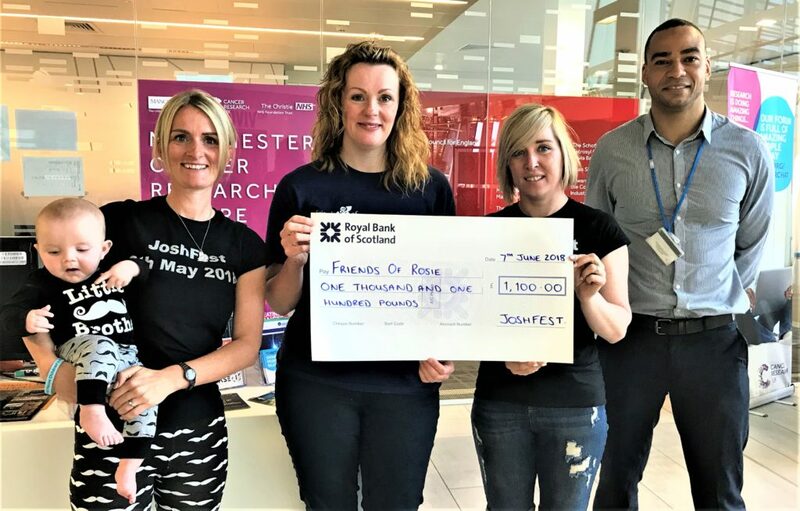 A whopping £3,541 was raised through the event, £1,100 of which has been kindly donated to Friends of Rosie. 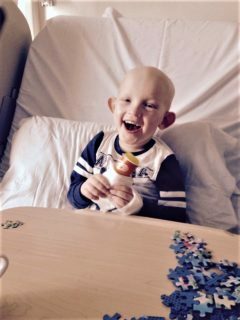 Joshua died from a very rare brain tumour in January 2017. Brain tumours continue to cause more deaths than any other type of childhood cancer. We are currently funding a two-year research project looking at the use of immunotherapy to treat childhood brain tumours, particularly those that don’t respond to current treatment methods. Said Joshua’s mum, Nicola, “During Joshua’s gruelling treatment, he experienced hearing loss and vision loss. His spine and skull also stopped growing due to the radiation. He was left with learning disabilities, had several infections, blood and platelet transfusions, and kidney damage from the high dose chemotherapy. During his treatment, he contracted pneumonia leaving him fighting for his life. A few weeks later he lost his battle. “Throughout Joshua’s illness, I was very vocal about the lack of research into paediatric cancer. I also realised that not all cancer charities are transparent about how they spend donations, which is why I chose Friends of Rosie. Being mainly a volunteer-led charity, I felt reassured that almost every penny raised would go directly into funding research.